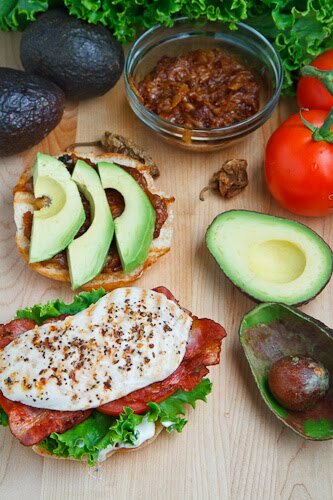 A grilled chicken club sandwich with smokin hot, sweet, caramelized onions and cool and creamy avocado. Armed with my (half devoured) batch of chipotle caramelized onions , the only question was, what to use them in? With the recent success of my grilled chicken club sandwich I was thinking that the chipotle caramelized onions would be a perfect fit. In fact with the chioptle this was sandwich was kind of reminding me of an avocado BLT with fried egg and chipotle mayo and I was thinking that the cool and creamy avocado would finish things off perfectly and complement the spicy heat of the onions! With the chipotle caramelized onions already prepared, this sandwich is as simple to make as cooking some bacon, grilling up the chicken and slicing some fresh vegetables. When using a chicken breast in a sandwich like this you want it to be relatively thin so that it gets cooked all the way through before you burn the outside and dry it all out and you can either pound a small breast thin or slice a larger one in half. I have to say that all of the flavours in this grilled chicken sandwich played amazingly well together! In addition to the awesome combination the spicy chipotle caramelized onions and the cool avocado, there was the juicy tomato and creamy mayo combo and of course the salty bacon was certainly welcome and the juicy, falvourful chicken brought everything home! I will definitely be making some more of the chipotle caramelized onions so that I can enjoy a few more of these sandwiches! Brush your grill with oil and heat it to medium heat. Season the chicken and grill until cooked, about 5-7 minutes per side. Assemble the sandwich and enjoy. I wish I had that for lunch! Gorgeous. 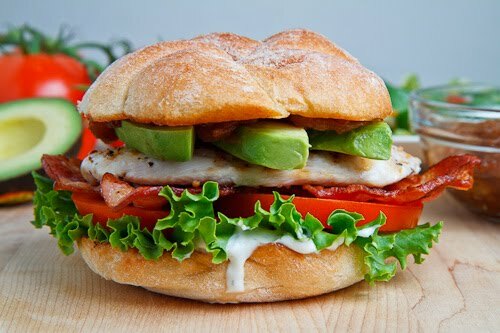 This sandwich would definitely get me excited for lunch! Those caramelized onions are swoon-worthy. The cara,lized onions are the crown on this sandwich Kevin. OH! I know what I am making for lunch Saturday! I'm not normally a big sandwich person, but this really does look like something special! Chipolte carmelized onions was pure genuis! Thank you for sharing that idea in your last post! But where in the world do you find the strength to have leftovers of them??? good sweet lord that is a sandwich kev. The only thing wrong with this sandwich is that it is not right in front of me right now. Delicious ! Those avocado slices are calling my name! Gorgeous sandwich! 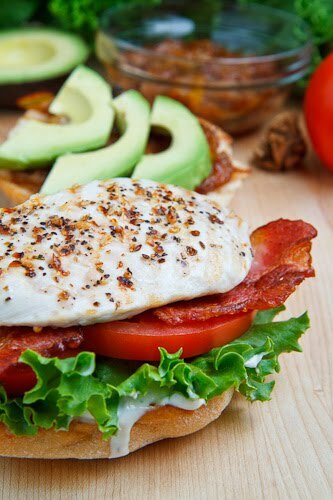 I love avocado with chicken and bacon – they just go together so well. Then you add these amazing onions, and I am drooling! Kelvin, It certainly looks healthy and delish! So full of ingredients. You are indeed a sandwich king. I have a freezer full of leftover chicken breasts because I overbought for a dinner party recently. This will be the perfect way to use some of them up!! Oh My God! This looks delightful. I've been playing with a patty press that I bought recently and might take inspiration from this to make my next burger. I often forget how refreshingly good a chicken sandwich can be. I love the sound of those caramelized chipotle onions as well. Thank you for stopping by my site and leaving a comment. I don't mean to sound like a spam for my site here, but I wanted you to know I've been to your site a bunch of times and always enjoyed your quality posts. Thank you! This is my type of sandwich! Caramalized onions are one of my favorites, and what beautiful photos! BLTs are on the board for tomorrow nights dinner, this would make the perfect addition to them. My mouth is watering just thinking about dinner tomorrow now! What a beautiful sandwich and stunning photos! I love it! I want to make this soon; so summery.